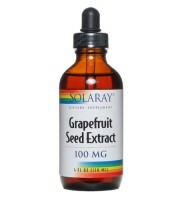 Grapefruit seed extract is another completely natural mould killer, similar to tea tree oil. It’s environmentally friendly, harmless to pets and people, inexpensive, available from most health stores, and extremely effective. However, many prefer grapefruit seed extract over tea tree oil because it has almost no odour, whereas tea tree oil has a very potent and distinct scent, which can linger for days. Much like tea tree oil, a small amount of grapefruit seed extract is very effective at killing mould. Grapefruit seed extract is also similar to baking soda, in the sense that it is also deodorizes, so it will help remove bad smells. Pour the solution into a spray bottle and shake well. Spray the solution directly onto the mould and leave for 5- 10 mins. If you don’t have a spray bottle, just thoroughly dampen a disposable towel and apply to affected area. Don’t rinse the solution away afterwards, allow the solution to naturally dry. The longer the solution is in contact with the mould, the more killing it will do and prevent the mould from returning. While grapefruit seed extract is completely natural and environmentally friendly, it’s still important to avoid contact with mould, so it is important to wear safety gloves.